In traditional Chinese medicine Ganoderma lucidum is famous for its beneficial effect on nervous system. It was traditionally used to manage different neurological disorders. This study was designed to investigate the nootropic potential of the mushroom. Nootropic activity was evaluated following the oral administration of two different doses (150 and 300 mg/kg) of ethanol extract of Ganoderma lucidum. Physostigmine (0.1 mg/kg) and Scopolamine (0.4 mg/kg) were used as positive and negative controls respectively. Distilled water was used as a control. Elevated plus maze and Morris water maze were used for the assessment of learning process. In elevated plus maze, initial transfer latency and retention transfer latency were assessed. In Morris water maze, TSTQ (time spent in target quadrant) and transfer latency were evaluated. For the assessment of locomotor activity, open field test was utilized. Furthermore, biochemical estimation of acetylcholinestrases (AchE) was performed by using Ellman’s method. The results of the study show that the Ganoderma lucidum extract has significantly increased the time spent in target quadrant (TSTQ) and decreased the escape latency (EL) in Morris water maze model. Whereas, a decrease in the Initial Transfer Latency (ITL) and Retention Transfer Latency (RTL) was observed in elevated plus maze model. Conclusion: The present study showed that Ganoderma lucidum has physostigmine like effect on brain acetylcholinesterase (AchE) activity. Memory is one of the most critical functions of the brain and a major process by which the things we experience and observe are recorded and utilized to react to the surroundings. It is considered as a fundamental unit for the survival of human beings . The centrally acting cholinergic neuronal system is considered as the most essential system in the regulation of several important functions of the brain including memory and learning . In the previous decades, Alzheimer’s disease has got extreme consideration [3, 4]. Alzheimer’s disease has been the sixth leading cause of the death in U.S . Loss of cholinergic neurons in the nucleus basalis magnocellular of cortex is considered as hallmark of Alzheimer’s disease . Oxidative stress, neuroinflammation, and disturbance in the lipid metabolism play vital role in the progression of Alzheimer’s disease . The impaired cognition in Alzheimer’s disease is counteracted with the drugs which have tendency of improving the cholinergic neurotransmission [8, 9]. Donepezil, rivastigmine, galantamine and memantine are most commonly used drugs to treat Alzheimer’s disease . Scopolamine is considered as main agent which causes memory impairment in animals by antagonizing the effect of acetylcholine at muscarinic receptors . Medicinal mushrooms have got importance in treating various types of chronic and acute disorders, these mushrooms have wide acceptance in the treatment of infectious diseases for several decades [1, 11]. Ganoderma lucidum is a famous mushroom because of its therapeutic efficacy. It is the one out of all therapeutic mushrooms, which is examined by many researchers. Ganoderma lucidum has been used as a remedy for many diseases and disorders for 5000 years. The mushroom is considered as a major part of Traditional Chinese Medicine (TCM). It is called as Lingzhi and is thought to be “The Mushroom of Immortality” in Korea and China . Ganoderma lucidum, is considered as “The king of herbs”. It is a fungus which grows on different defunct and dead trees, especially willow, oak, sweet gum, maple and elm. Ganoderma lucidum has a long history of use for propelling life span and for a healthier life style in China, Japan, and other Asian countries. Ganoderma lucidum is generally known as Reishi . Ganoderma lucidum possesses different pharmacological effects, including, calming, antiatherosclerotic, anti-inflammatory, analgesic, chemopreventive and anti-aging effect [13, 14]. Radioprotective, cytotoxic, antitumor, antibacterial, sedative, hypolipidemic, antiviral (for HIV), antifibrotic, hepatoprotective and antioxidant activities have also been seen in the mushroom [15, 16]. In the latest studies, Reishi has shown its effectiveness in the treatment of carcinoma, leukemia, diabetes and hepatitis . This study was designed to evaluate the nootropic activity of ethanol extract of Ganoderma lucidum on normal and memory deficit mice. Ethanol extract of fruiting bodies and cracked spores Ganoderma lucidum in capsule form branded as ReishiMaxGLpTM, was purchased from Pharmanex Inc. (United States of America). Male Swiss albino mice (Mus musculus) weighing about 22–25 g were utilized in this study. Thirty mice divided in five groups (n = 6) were used in this study. The animals were procured from Liaquat National Medical College, Karachi. The temperature of the area was kept 23 ± 0.5 °C. Water ad libitum was provided to the mice. Mice were acclimatized in laboratory environment before the start of the study. The guidelines of National Institute of Health (NIH, 8th edition) were followed throughout the performance of research experiments. Handling of the animals was done according to the requirements mentioned in “Guidelines for the care and use of laboratory animals 8th edition” . The selection of doses was made as per research literature, that is, 0.4 mg/kg for scopolamine, 0.1 mg/kg for physostigmine were used . Ganoderma lucidum extract was given in two doses that is, 150 mg/kg and 300 mg/kg . Elevated plus maze (EPM) is considered as main model to evaluate learning and cognition in rodents. It is comprised of two open arms (16 × 5 cm) and two enclosed arms of same size as of open arms, having walls of about 5 cm. This instrument is protracted from a center (5 × 5 cm) and the instrument is elevated to the height of 25 cm. On the initial day of the experiment, (10th day of dosing), every animal was settled at the edge of any of the open arms. Initial Transfer Latency (ITL) was noted down on the initial trials for each animal. Initial transfer latency is defined as the time in which the animal moves from one of the open arms into any of the two closed arms with its all limbs. When the animal did not enter any closed arms within 90 s, the mouse was smoothly directed into one of the two closed arms and the ITL was assigned 90 s. The animal was then allowed to explore the maze for 120 s and then placed back into its home cages . The remembrance of this memory was then evaluated later twenty-four (24) hours after first training; this is termed as Retention Transfer Latency or RTL [22, 23]. Morris water maze (MWM) is considered as accurate model for evaluating learning of task and evaluating ongoing memory in rodents. Here MWM was utilized which was consisted of round tank 60 cm wide and 25 cm tall. This round tank was filled with water and temperature of water was kept 25 °C. The water was turned cloudy with nontoxic white colored dye. Tank was divided into four equal quadrants i.e. North, South, East and West, which were made on the tank by using two threads which were crossed in the middle perpendicularly to each other and were firmly attached on the top of the tank. In target quadrant of tank (Q4), a platform (6 × 6 cm) was placed. The water level was 1 cm above the platform which made it opaque. Every mouse was subjected to search the submersed platform and to stay on platform for 20 s. Every mouse was smoothly put in any quadrant (except Q4) during the trial session. The mouse was placed in such a way that it faced the wall of tank. After every trial the location of mouse was changed, and 120 s were assigned to every mouse to search submersed platform. The platform was kept untouched and the position was remained unaltered during the training session . When the mouse was unable to find the platform in the prescribed period i-e 120 s, was smoothly guided towards the platform and allowed mouse to stay on platform for 20 s .
Escape latency (EL) recorded from 6th till 9th day of administration of drug for each animal. Trials for four consecutive days were done on every mouse. EL is defined as the period in which animal start moving from starting quadrant in search of hidden platform in the target quadrant. Training session for four consecutive trial days were done according to following pattern. 1st Day: Q1, Q2, Q3 and Q4. 2nd Day: Q2, Q3 Q4 and Q1. 3rd Day: Q3, Q4, Q1 and Q2. 4th Day: Q4, Q1, Q2 and Q3. * “Q” is denoted for Quadrant. After Escape latency session and testing, TSTQ (time spent in target quadrant) was noted. The platform was removed from the tank and each mouse could swim freely for 300 s. The average time spent in each quadrant was noted. The average time in target quadrant (Q4) was also recorded in which the mouse could find the removed platform. This finding of platform is considered as a sign of memory retrieval. The observer stood in the same position throughout the training and test days [24, 25]. To rule out the effect of the extract on motor activity, we examined ambulatory behavior of the animals in open field test. An open-field is a wooden box (45 × 45 × 40 cm) with the floor partitioned into 16 squares. Every mouse was settled at the central square of the field and then ambulation (number of squares crossed) was noted for 10 min. This ambulation will represent the locomotor activity of the mice [26, 27]. At the end of the study, the mice were sacrificed. The whole brain was collected and subjected to homogenization in a glass homogenizer containing 10 ml of 0.9% of NaCl solution and homogenized in an ice bath. The homogenate was then placed in the centrifugation machine set at 3000 rpm for 10 min. The centrifugation caused the presence of cloudy supernatant liquid which was then used for detection of cholinesterase level in the brain . To determine cholinesterase levels in brain of mouse the Ellman method was adopted. The method involves the acetylcholine iodide from and dithiobisnitrobenzoate. The reaction between dithiobisnitrobenzoate and acetylcholine iodide resulted in formation of thiocholine which formed yellow colour appearance and this yellow coloured precipitate formation in the reaction was considered as an end point of the method. The spectrophotometric analysis was done to determine rate of thiocholine formation from acetylcholine iodide in the presence of tissue cholinesterase and 5,5′-Dithiobis-(2-Nitrobenzoic Acid) (DTNB) was treated with the brain sample and the optical density (OD) of yellow colour compounds formed during the reaction was measured in spectrophotometer at the wavelength of 412 nm every minute . The data were presented as mean ± standard error of mean (SEM). The data were analyzed by one-way ANOVA followed by Tukey’s post hoc test. A probability level of 0.05 or less was accepted as significant. Initial transfer latency of the scopolamine treated animals was increased significantly when compared with control group. 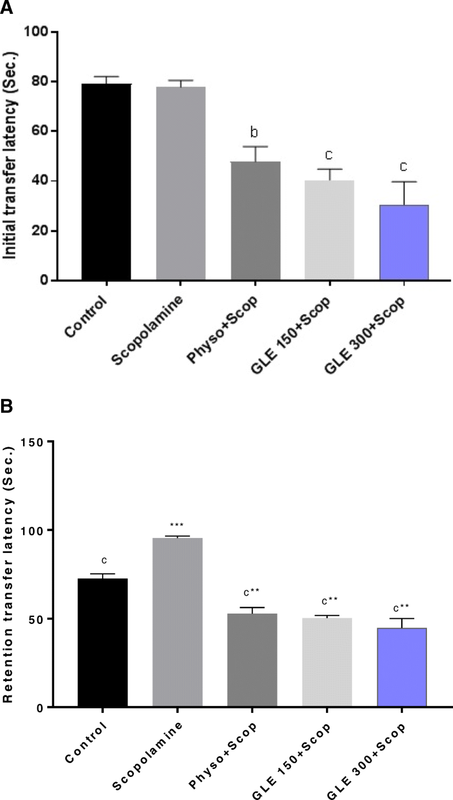 Whereas, initial transfer latency of mice treated with physostigmine, Ganoderma lucidum extract 150 mg/kg and 300 mg/kg decreased when compared with scopolamine group. It was further observed that Ganoderma lucidum showed more significant decrease at the dose of 300 mg/kg when compared with 150 mg/kg group (Fig. 1a). Furthermore, retention transfer latency was increased significantly when compared with control group. Co-administration of scopolamine with Ganoderma lucidum extracts at both doses, the retention transfer latency was decreased significantly when compared with the mice in which scopolamine alone was administered. 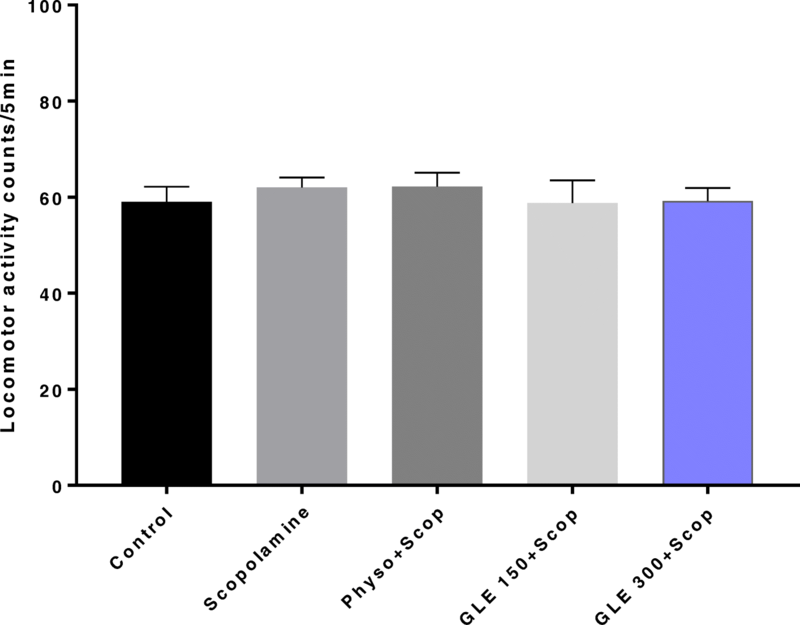 Physostigmine co-administered with scopolamine treated group also shown decrease in retention transfer latency when compared with scopolamine alone treated animals (Fig. 1b). The results show that the time spent in target quadrant of Morris water maze was significantly decreased in the mice treated with scopolamine when compared with control group. 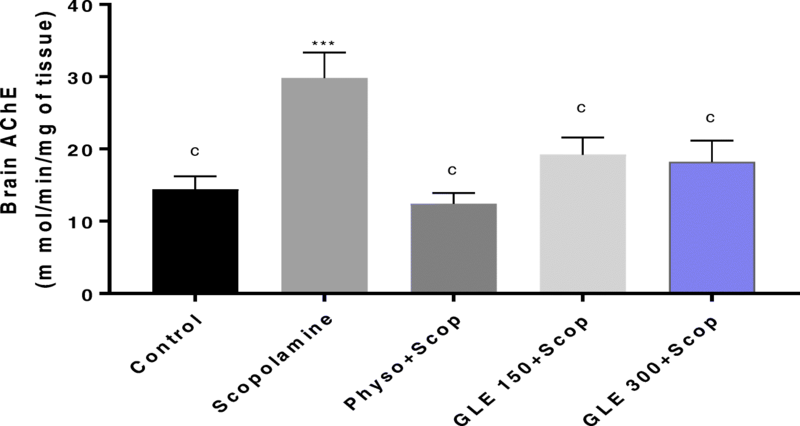 On other hand, the mice in which Ganoderma lucidum extract was co-administered with scopolamine showed significant increase in time spent in target quadrant when compared with scopolamine alone administered group. This has proved that Ganoderma lucidum extract has potential of increasing the retention time of ongoing learning memory (Fig. 2). The Escape Latency (EL) of different groups on 6th to 9th day of drug administration was also assessed. It was observed that on 6th day of the drug administration the escape latency of scopolamine alone treated animals was significantly increased when compared with control group. Co-administration of Ganoderma lucidum extract with scopolamine showed significant decrease in EL when compared with scopolamine alone treated mice on 6th and 9th day of the study (Table 1). The results of the activity of AchE in mice brain suggested that scopolamine alone treated group has significantly increased brain AchE activity when compared with control group. Ganoderma lucidum extract, co-administered with scopolamine, and physostigmine co-administered with scopolamine, have significantly reduced the brain AChE activity in mice brain when compared with the scopolamine alone treated group (Fig. 3). 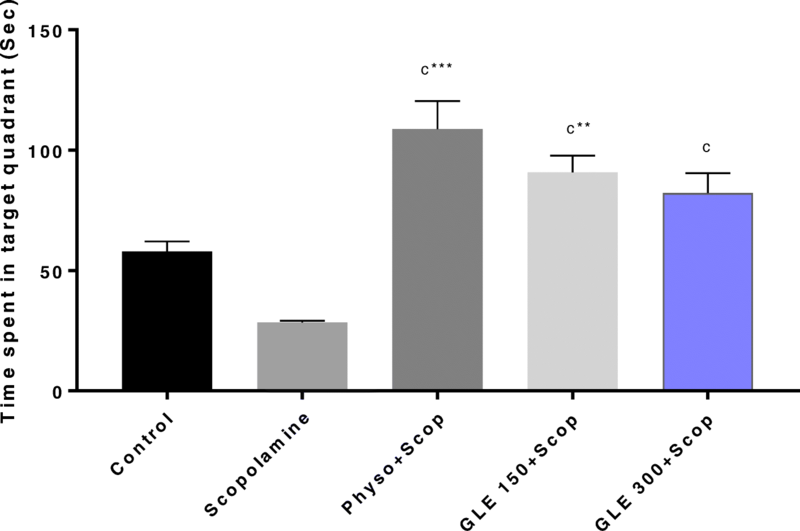 The results show that the locomotor activity of the different groups was similar when compared with control group and scopolamine induced memory deficit mice. This showed that Ganoderma lucidum extract has no effect on the motor activity of the mice (Fig. 4). Numerous scientific studies have been carried on Ganoderma lucidum for evaluating the pharmacological activities of the mushroom. This research was performed to evaluate the nootropic effect of the ethanol extract of Ganoderma lucidum in memory impaired swiss albino male mice. The memory was impaired by using scopolamine. Scopolamine is an alkaloidal drug which is extracted out from Datura stramonium. Scopolamine has tendency to impair memory in humans and animals, that is why it is used to cause long term or short-term memory impairment in rodents . Learning process and memory in rodents is mainly evaluated by using elevated plus maze (EPM) model. It is considered as the validated model for the assessment of memory . Transfer Latency (TL) of this model is found to be useful parameter for the assessment of cognition. TL is basically time taken by the rodent to shift itself into one of the closed arms from the open arms. In EPM, acquisition (learning) can be considered as transfer latency on first day trials and the retention/consolidation (memory) is assessed after 24 h.
Ganoderma lucidum significantly reduced the Initial Transfer Latency (ITL) on 10th day of the treatment. Moreover, Ganoderma lucidum also significantly reduced the Retention Transfer Latency (RTL) on 11th day of the treatment after administration of scopolamine for the impairment of memory, indicating that Ganoderma lucidum improved the learning task and retained the information [10, 21, 30]. In Morris water maze, a decrease in escape latency (EL) during training and an increase in time spent in the target quadrant during retrieval indicated improvement of learning and memory respectively; and vice versa. Ganoderma lucidum did not produce any significant alteration in locomotor functions of the animals when compared with distilled water treated control group, hence, the drug did not show any motor effects. Therefore, memory boosting activity of Ganoderma lucidum is specific and not false positive. Scopolamine induced memory impairment causes increment in AchE action and oxidative stress in brain. Furthermore, it is believed that scopolamine has got tendency to hinder the neurogenesis process of the brain which causes impairment in cognition . Many studies have shown that scopolamine alters the process of receiving, collecting and remembrance of information. Drugs which have potential of increasing the cholinergic neuronal activity, are effective against memory impairment. Physostigmine is one of the drugs which increases cholinergic neuronal activity in brain and can combat the memory impairment . Acetylcholinesterase activity was analyzed in the brain sample of mice. This marker enzyme is essential for detecting the cholinergic status in the brain . The acetylcholinesterase determination has supported the results of elevated plus maze and Morris water maze test activity of mice in which the statistical reduction in the AChE activity caused the increment in the acetylcholine level in the brain of the mouse which resulted in increased function of memory. Therefore, the current study suggests that the ethanol extract of Ganoderma lucidum has dose dependent potential on cholinergic neuronal system and this resulted in elevating the brain acetylcholine level which resulted in improvement of memory function [30, 32]. The study has revealed that ethanol extract of Ganoderma lucidum has nootropic potential and has capability of improving the memory of learning and ongoing tasks. Furthermore, the results of the study indicate that ethanol extract of Ganoderma lucidum exerts reversal action on scopolamine induced impaired memory and can be used as an agent for enhancing the cognition pattern. This research study was not granted any specific fund. Study design and supervision, analysis of data, graphical representation, interpretation of results and drafting manuscript were done by MA. Sample collection and laboratory experiments were performed by NK. Both authors read and approved the final manuscript. Handling of the animals was done according to the requirements mentioned in “Guidelines for the care and use of laboratory animals 8th edition”. Prior approval of the ethical review committee of Ziauddin University was taken before starting this research study.